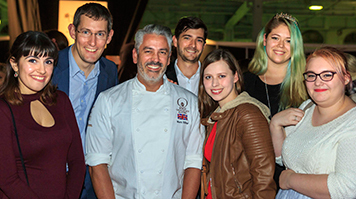 London South Bank University (LSBU) hosted the final of the International Chocolate Awards 2016, celebrating the most talented chocolatiers from around the globe. LSBU’s National Bakery School lecturer, Barry Johnson, hosted the awards where more than 150 entrants submitted their products. Members of the main jury took 3 days to taste all the products, before the Grand Jury decided the final winners after a two-day tasting session at the National Bakery School. Mr Johnson said: “Hosting the world final of the awards was a monumental experience for me and has also given our students a fantastic and invaluable experience of how industry professionals operate. “Not only did our students have the privilege to be exposed to some of the best chocolate products in the world, but they also got to see first-hand how these are evaluated and judged, as well as being able to taste them. The awards ceremony was held at The Chocolate Show in London’s Kensington Olympia. The judging panel of Grand Jury members and international judges, local chefs, journalists, bloggers and chocolate specialists announced prize winners for each category including: milk chocolate bars with an infusion or flavouring, nut based pralines with milk chocolate, dark chocolate enrobed caramels and spreads and plain chocolate bars. Some of the most unique chocolate on the day included the Sweet Onion Caramel, submitted by US company Theo Chocolate, who received a gold award. Japanese company Es Koyama won a gold award for their dark chocolate bars with Praline Takuan (pickled radish) filling. Founded in 2012, the awards are the world’s only fully independent international fine chocolate competition to support companies and chocolatiers producing and working with fine chocolate. Through this support, the awards also support the growth, sustainability and development of fine cacao farmers as well as making consumers more aware of the hard work and craft that goes into the best fine chocolate products.